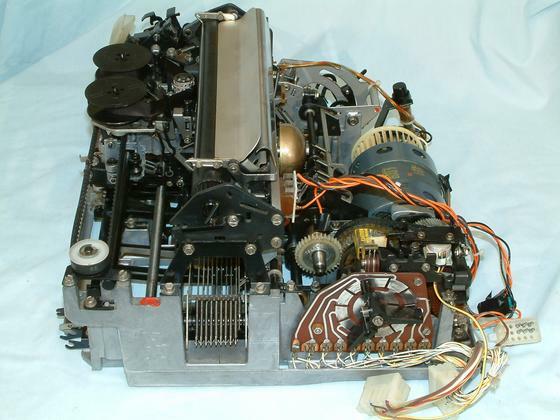 This is the right side of the ASR 33 Teletype teletypewriter set main assembly. In the lower right is the distributor contact and brush assembly which converted the parallel data to serial data to send to the computer. It normally is covered by a plastic guard. The green bit wrapped in electrical tape with the orange and black wires is the tape reader run relay. The PDP-8 required that the tape reader be under its control so a relay was added to the teletype. I didn't get the teletype that was with my 8/I so I added the relay myself to this teletype.